I wanted to take advantage of the nice weather for what may end up being my last outing this year. After asking some questions on some online sites, and some info from the new caretaker at Olallie Lake, I decided to try my luck and see how far I got. I wasn’t quite sure what I was going to find, since it looked like there might be a fair amount of snow. The plan was to Hike the east end of the Red Lake trail, hike up to Timber Lake, then head up Red Lake to Potato Butte and then back down to Double Peaks and then back to where I started. I got up early to do this hike, and left the house at 6:30. 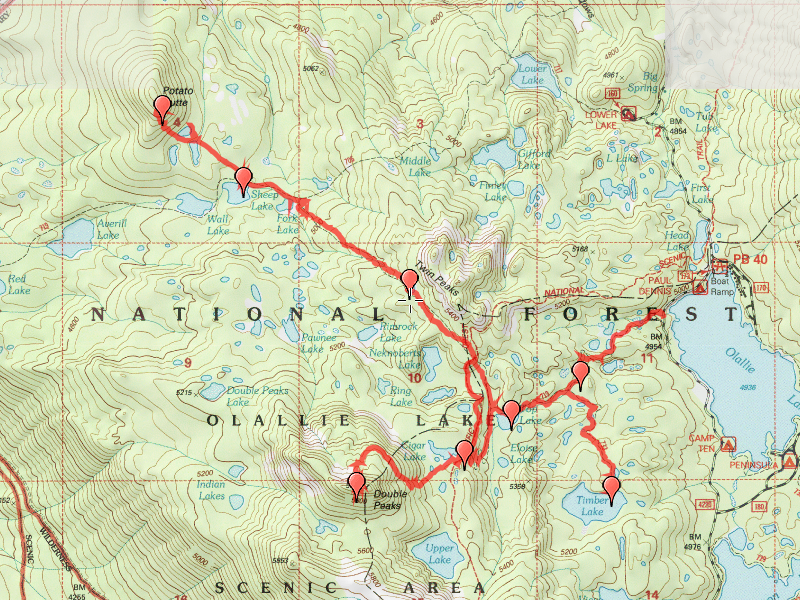 By 8:00, we were at the trailhead at Olallie Lake. I couldn’t believe the conditions. On the way in, I started seeing a little bit of snow at about 4200′. I figured I wouldn’t be able to get up to Double Peaks (almost 6000′). Once I got to the trailhead, there was VERY little snow on most of the trip. What was on the ground melted from the time I left to the time I came back. It was an absolutely GORGEOUS day. To summarize the trip in a few words â€“ Rocky, wet, chilly and totally cool. The trails were in good shape (thank you volunteers! ), but due to all the snowmelt, the trails were under a lot of water. As many of these trails go through wet areas, the trail gets swallowed up, so it took some attention to watching the trail in order to keep following it. The trail would head into a wet area and you would have to hunt to find out where it exited on the otehr side of the wet area. Kept me on my toes. It was a rather chilly in the morning, and in the shade on some of the trails. The lakes in the area are actually very nice. There are LOTS of them. Timber lake is a fair sized lake with some good camping opportunities around it. Next was Top Lake, which was another nice lake. Then there was Fork Lake, another named lake (there are LOTS of un-named ponds/lakes/bodies of water). I wanted to head up to Potato Butte and find the “potatoes” that it was named for. My daughter and I were up there about 4 years ago, but we didn’t know about the potatoes, so we just went to the top for the view. This time, even though I was running late, I really wanted to see the potatoes. I found the side trail and snapped some photos. Since I was already running late, and since I had been there before, I didn’t go all the way to the top. Back down the trail, taking the Top Lake trail which was a little bit of a detour from the way I came up. It heads up to Cigar Lake where you can take the Double Peaks trail up to the top of Double Peaks. When I got up to Double Peaks, there was a bit of snow on the trail, but not too much. I was able to stay on the trail all the way to to the top. The trail sheet says the trail is steep, and BOY were they not kidding! It basically walks up the side of the hill. With the snow, it made it doubly difficult. But, I made it up to the top and the view was astounding. Mt Jefferson was RIGHT in front of you and you get a 360 degree view. I could have stayed up there for a while, but I was still/already behind schedule, so after a few minutes, some water and photos, we left to head back to the truck. I will be coming back in the summer sometime. To try and make up some time on the way back, we quickened our pace and since most of the trip back was downhil, it made it a little better. We made up most of the time we were late, and got back to the car a little after 2:00. A glorious day in the woods!